With all but four Sub-Saharan African countries coming in on the lower half of the 2011 Corruption Perceptions Index, it’s easy to focus on the bad news. But Chantal Uwimana, Regional Director for Africa and the Middle East says the results can be a motivation for governments and citizens alike to tackle corruption, with a focus on the power of the individual to create change. 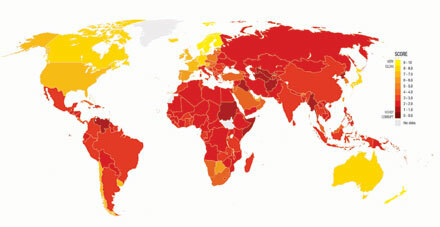 The deep red marking Sub-Saharan Africa on the 2011 Corruption Perceptions Index map confirms that public sector corruption is seen as endemic in the region. Only Botswana, Cape Verde, Mauritius and Rwanda score above 5 on the Index. Some governments in the region have undeniably made enormous efforts to curb corruption and promote good governance, but the full impact of new institutions and laws remains to be felt. From mismanagement in public education to police abusing their power, corruption continues to plague the daily lives of citizens in Sub-Saharan Africa. In the Index, the link is clear between high levels of corruption and the weak political and administrative institutions that result from prolonged periods of conflict. Countries like Angola, Burundi, Chad, the Democratic Republic of Congo, Equatorial Guinea, Somalia and Sudan score lowest in the region and in the bottom twenty countries globally. Political, tribal, religious and geographic interests often interfere in public decision making processes and have a direct impact on governance issues and the fight against corruption. But the good news is that with strong political will at the highest levels of government, corruption can be curbed. Rwanda serves as an encouraging example. Improvement is possible and can be seen within a relatively short period, through a firm commitment to strengthening political, judicial and administrative institutions. But the results of the Index should not only be seen as a call to governments across the region to step up their efforts in the fight against corruption, but to ordinary citizens as well. Now is the time to act! We can no longer continue to simply complain about alarming levels corruption in our region. We need an individual and collective commitment to denounce and act against corruption, rejecting the apathy that comes from tolerating impunity for so long.